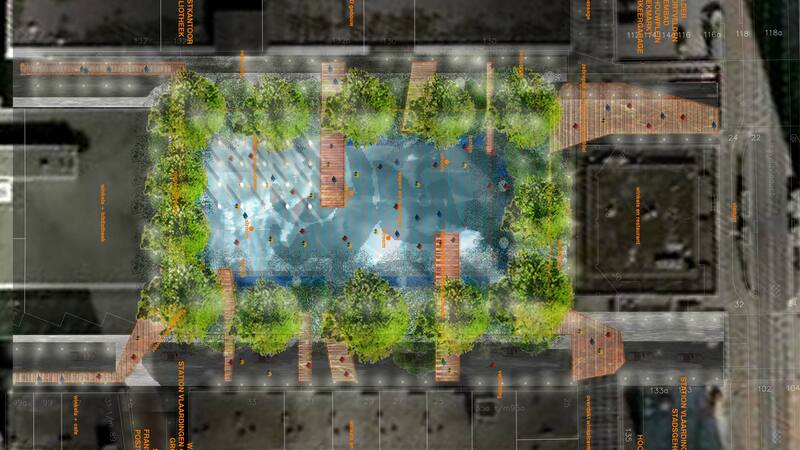 Reallocation of existing plaza, a design for a new outdoor space. The Veerplein is a sampling of some post-war, modernist architectural movements. This mixture is a quality that we want to nurture, strengthen and continue with a new, forward-looking approach. The Veerplein is characterized by an interior space – a square within rows of trees – and an outdoor space – the space between the rows of trees and buildings. The square is therefore not really open, but neither is it really closed. There is no distinct transition from outside to inside and vice versa. This diffuses the experience of the square and its surroundings. In order to improve the square and give it a clearer character, the draft design proposes reusing the square and adding accents. The square will be lowered approximately 50 cm to correspond to the foundation of the Hospitality Pavilion. 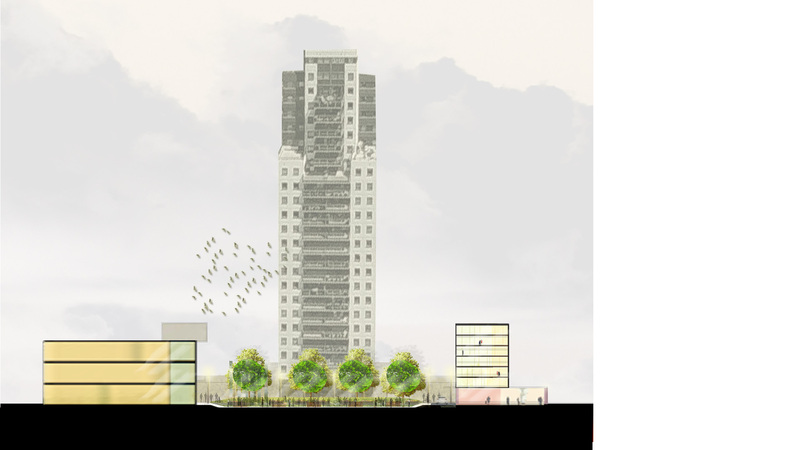 The existing foundation is the starting point for the new design and determines the framework of the new intervention. 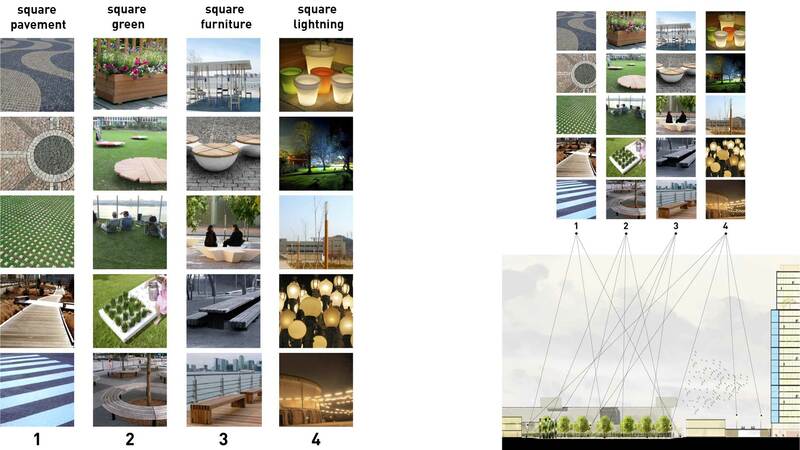 The square will be treated with a reflective coating in a grid of 21 x 32m. Provisions are made for electricity within that grid. 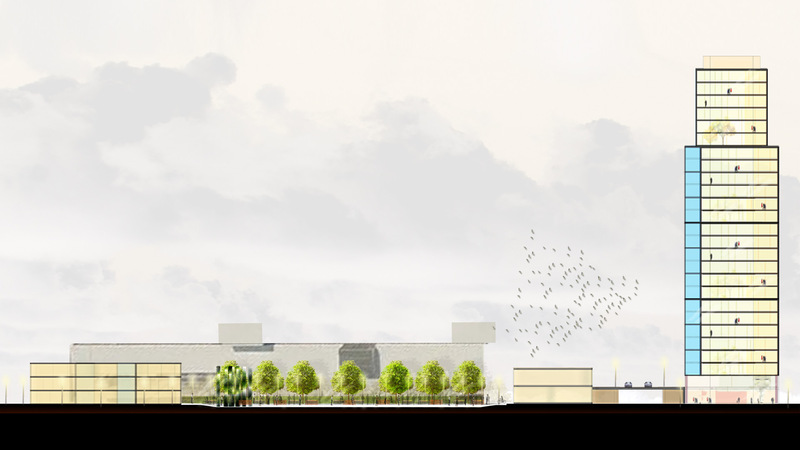 Rows of trees sit on three sides of the square, and additional trees will be planted on the fourth, southwest side where the library is located. On the main access routes to the square, crosswalk markings will serve as a connecting element and anchor the square to the shopping areas and the rest of the city. This is done in conjunction with the new lighting of the facades which enclose the square. During the day, the crosswalks lead shoppers from the square to the shops, and in the evening the square will be illuminated by light emanating from the shops’ facades. The existing concrete benches are to be converted into large flower containers and will delineate the edges of the square. On the square, new comfortable seating units will be installed. The pavilion will disappear and on its foundation mirrored columns will be erected. Thus, the openness of the square will be once again restored and its qualities will be reflected through the columns many times over.